With the introduction of the R-16 ballistic missile, the collective led by Michael Yangel based in Dnepropetrovsk ended the monopoly held by Sergei Korolev's design bureau as the only supplier of the intercontinental ballistic missiles for the Soviet military. The R-16 offered significant advantages to the strategic missile forces in comparison to the R-7, the first and only ICBM in the armaments at the time. Unlike the R-7, the R-16 used storable propellants, which meant it could stay fueled for long periods of time ready to fire. Additionally, the R-16 was more compact than the overweight R-7, allowing to deploy the new missile in underground silos. Finally, the R-16 was equipped with the autonomous flight control system, which eliminated the need for a network of ground control stations needed to support the R-7. Yet, the R-16 flight record was preceded with the worst disaster in the history of rocketry, which claimed at least 92 lives. According to the official history of Yuzhnoe Design Bureau, the Soviet Council of Ministers approved the development of the R-16 ICBM on December 16, 1956. (23) At least two more decrees by the Council dealt with R-16 development: one on May 28, 1958 and another on May 13, 1959. The preliminary design of the missile was completed by November 1957. (74) Both stages of the missile would equipped with main engines developed by the OKB-456 in Moscow and steering engines developed by OKB-586. The missile was made of aluminum and magnesium alloy with thin propellant tanks. The compressed air would pressurize the propellant tanks of the first stage, and atmospheric air the tanks of the second stage. Ground-based launch complex for the rocket was designated Sheksna-N and would include a pair of launch pads with common fueling and support systems. An original ground-based launch complex for the R-16 would be built on the right (Eastern) flank of Tyuratam  two surface pads at Site 41 and processing area at Site 42. The 2nd Test Directorate was formed in Tyuratam specifically for the R-16 operations. In March 1960, under a directive from Deputy Chairman of Soviet of Ministers Dimitriy Ustinov, the R-16 developers contacted Leningrad-based TsKB-34 (KBSM) to study the possibility of development a silo-based launch complex for the R-16. On May 30, 1960, the government issued an official assignment for the development of the silo-based missile designated R-16U (8K64U). The silo-based complex for the missile was designated Sheksna-V. The specifics of the silo launch required changes in the design of the missile itself. For example, high-pressure nitrogen gas tanks were used to pressurize fuel tanks on both stages and the oxidizer tank on the second stage. The preliminary design of the silo complex was under review in March and October 1960. The blueprints of the complex were completed by March 1961. 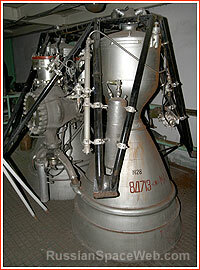 In August 1960, the propulsion units of both stages fir the R-16 were tested in NIIKhimmash's Zagorsk facility. The first launch of the R-16 missile was scheduled for the end of October 1960, before the celebration of the Bolshevik Revolution on November 7, however on October 24, a disaster on the launch pad killed at least 92 people, including some key figures in the R-16 development. 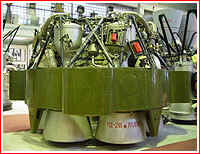 The RD-252 engine is being prepared for integeration with the second stage of the R-36 rocket at the Yuzhmash plant. At the time of the accident as many as five missiles were in production at Plant Number 586 in Dnepropetrovsk. Since OKB-586 chief designer Mikhail Yangel ended up in the hospital right after the accident, Vitaliy Chekhovskiy, a leading engineer at OKB-586, was put responsible for preparing the R-16 missiles for further tests. Vladimir Sergeev, the department chief at NII-885 control system design bureau, accepted a proposal from Central Committee of CPSU to replace Boris Konoplev, who was killed in the R-16 accident, as a director of Kharkov-based OKB-692. At OKB-692, Sergeev led the upgrades of the R-16 flight-control system, which was primarily blamed for the disaster of October 24, 1960. On January 27, 1961 at 8 a.m. the R-16 missile (Number 3L-5T) was rolled out to the launch pad at Site 41. After several delays, the R-16 blasted off from Tyuratam on February 2, 1961 at 22:00 local time. Beginning at 165 seconds in flight, the yaw control onboard the second stage failed. The missile and its mockup warhead crashed 530 kilometers north of Siberian city of Tomsk. During the spring and summer 1961, the R-16 test launches continued with less than impressive results, however, the extensive campaign to teach the R-16 to fly slowly started paying off. On November 1, 1961, the first "battle stations" armed with R-16 ICBMs were declared operational in Tyuratam, near the towns of Nizhniy Tagil and Yuriya. In the meantime in 1961, in Tyuratam, the construction of the silo complex started at Site 60 on the east flank of NIIP-5. Also designated as Object 310, the facility would include three launch silos. A. Nitochkin from Central Design Institute of the Ministry of Defense, also known as TsPI-31, led the construction effort. The testing of the R-16U version of the missile designed for silo launchers started in January 1962 from ground-based pads. On June 13, 1962, the R-16U blasted off from the silo facility for the first time. The missile left the silo successfully by a steering engine failed in flight. The problems developed in several consecutive flights but had been solved eventually. On February 5, 1963, the first unit armed with R-16U was declared operational. 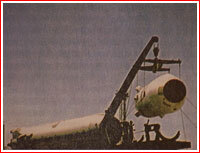 On march 30, 1963, three silos with R-16U missiles were put in operational service in Plesetsk. On October 8, 1963, during "Groza" (Thunder) exercise, for the first time, the R-16U was launched from the operational silo in Plesetsk. On October 19, 1966, the demonstration launch of the R-16U missile was conducted from Pad Number 8 in Tyuratam. By 1965, 186 launchers for R-16 and R-16Us were deployed across the USSR in Nizhniy Tagil, Bershet, Bologoe, Itatka, Yoshkar-Ola, Novosibirsk, Shadrinsk, and Yuriya. The R-16 missile was retired in the mid-1970s. In June 1966, OKB-586 proposed to the government a series of space launchers based on its R-14, R-16 and R-36 missiles. Like two others R-16-derived launchers, it would be equipped with C5M upper stage also developed by OKB-586. The launcher was designated 11K64 and retrospectively named Tsyklon-1. The 11K64 launcher would be able to deliver 700 kilograms of payload to a 1,000-kilometer polar orbit. Unlike his siblings based on R-14 and R-36 missiles, the R-16-derived booster has never flown. 1961 Feb. 2 at 22:00 local time, (Production Number 3L-5T): Beginning at 165 seconds in flight, the yaw control onboard the second stage failed. The missile and its mockup warhead crashed 530 kilometers north of Siberian city of Tomsk. 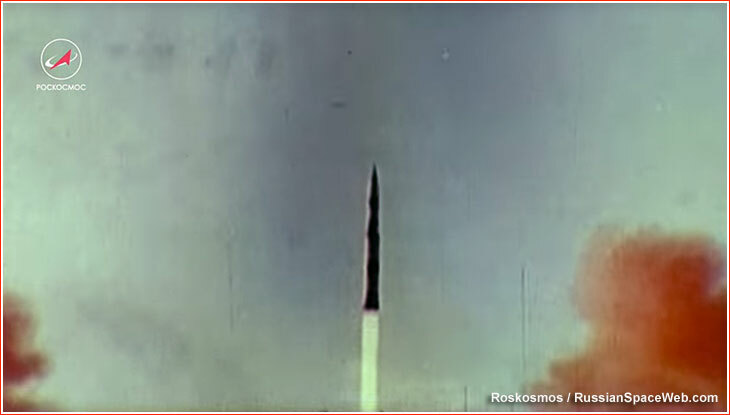 1961 March 3 at 16:59:19 local time, (Number 4L-6T): This time stabilization of the vehicle was lost after separation of the first and second stage and the second stage and the warhead fell 70 kilometers north of city of Birobidzhan. 1961 April 15 at 16:58:29.5 local time and only three days after Gagarin's flight, the R-16 missile (Number 7L-12T) blasted off from Tyuratam. This time it got much farther than its predecessors, however, the second stage cut off earlier than planned. The missile fell 122.61 kilometers short of its target. 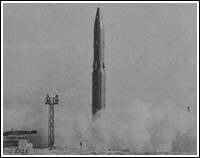 1961 April 21 (Number 6L-11T): This time the missile went out of control only 85.2 seconds after the launch. The automatic destruction system (AVD) destroyed the vehicle and its debris fell 386 kilometers downrange. 1961 May 16 at 22:23:27.5 local time, (Number 8L-8T): For the first time, the flight went more or less normally. The missile overflew its target by 5.54 kilometers and deviated 6.55 kilometers to the right. 1961 May 24 at 06:18:06 local time, (Number 9L-9T): The engine Number 3 of the 1st stage of the missile failed to develop the thrust during the launch. The vehicle fell within 8-10 kilometers from the launch pad. 1961 June 2 at 20:24:30.6 local time, (Number 10L-10T): The flight went normally. The missile overflew its target by 3.45 kilometers and deviated 9.41 kilometers to the right. 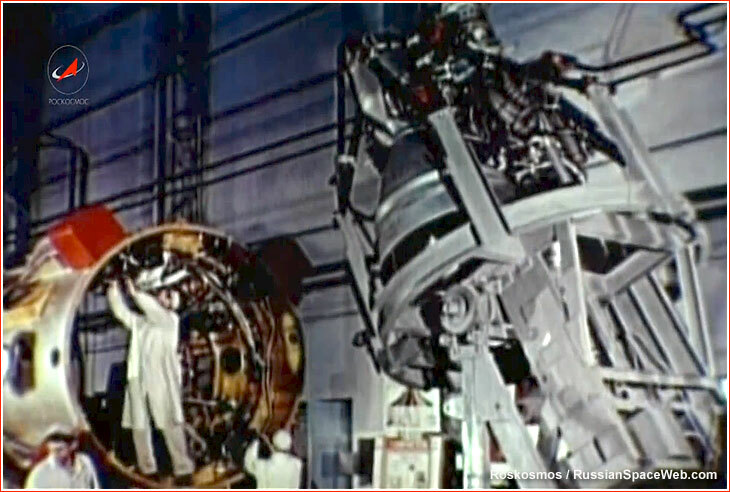 1961 June 6 at 21:00 local time, (Number 11L-13T): The steering engine on the second stage failed to develop the thrust. The missile fell 540 kilometers north of city of Tomsk. 1961 June 16 at 10:47:23 local time, (Number 14L-16T): The engine Number 2 on the 1st stage of the missile failed to develop the thrust. The rocket fell 500 meters from the Launch Pad Number 5. 1961 July 22 (Number 13L-15T): The flight control system sent an earlier than planned cut off command to the 2nd stage engine at 152.9 seconds. The missile fell 124 kilometers from the city of Omsk. 1961 Aug. 9 (Number 12L-14T): The vehicle developed flight control problems. The missile overflew its target by 7.78 kilometers and deviated 75.85 kilometers to the right. 1961 Aug. 13 (Number 21L): The vehicle developed flight control problems. The missile overflew its target by 10.1 kilometers and deviated 52.7 kilometers to the right. 1961 Sept. 4 (Number 23L): The flight went normally. The missile overflew its target by 0.878 kilometers and deviated 0.037 kilometers. 1961 Sept. 10 (Number 22L): The flight went normally. The missile overflew its target by 0.62 kilometers and deviated 0.68 kilometers. 1961 Sept. 13 (Number 17L) was launched from Tyuratam, for the first time heading to toward the target in the Pacific Ocean instead of the Soviet Far East in the previous launches. The flight went normally. 1961 Sept. 17 (Number 15L) toward the Pacific Ocean target: The flight went normally. 1961 Sept. 22 (Number 16L) toward the Pacific Ocean target: The second stage engine failed. The missile fell 325 kilometers from the launch site. 1961 Oct. 9 (Number 2LU) toward the Far East target: The flight went normally. 1961 Oct. 11 (Number 1LU) toward the Far East target: The launch failed due to the engine problems on the first stage. 1961 Oct. 15 (Number 4LU) toward the Pacific Ocean target: The flight went normally. The missile fell slightly short of target. 1961 Oct. 22 (Number 3LU) toward the Pacific Ocean target: The flight went normally. 1961 Oct. 28 (Number 5LU) toward toward the Pacific Ocean target: The flight went normally. The missile fell slightly short of target. The integration of the first and second stages of the R-16 ICBM. Credit: KB Yuzhnoe.